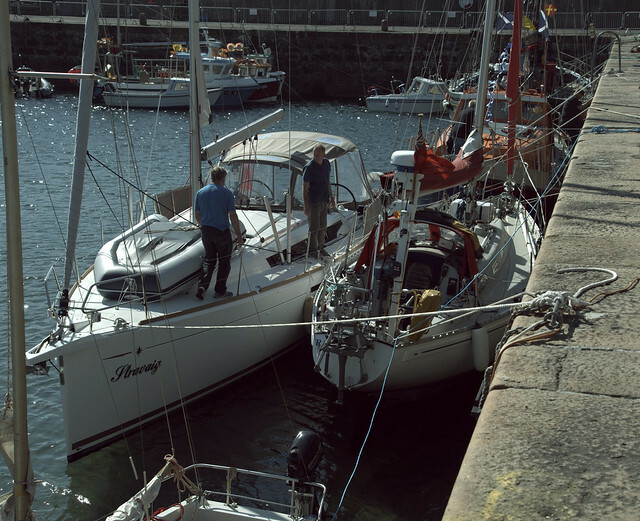 On the 29th of June, Edan and I took Raasay through to Portsoy for the boatshow. We had an uncomfortable night on the first night because she settled very head down - the slope of the bottom was against us. On Saturday we swapped round. Portsoy was just the first step in a much larger master plan, though, and on the Monday (2nd July) I sailed round to Peterhead. I did some final checks and tasks, and some business in Aberdeen, and then Angus joined me on Wednesday night to sail for Vlieland on Thursday morning.